Have you ever gave a damn thought who won the biggest Jackpot in Keno and how much? Let me tell you, it was a 43-year-old Newcastle man who has won the biggest Keno jackpot in Australian history and the win was a whopping $7,898,799.30 – at the Northumberland Hotel in Lambton. On 10th August 2018, the Keno Mega Millions jackpot was won, which was the third 10-number jackpot – the top Keno prize – and it was the biggest cash prize ever won in the country since Keno started. He said that I believe in such things, but I can’t really believe it has happened to me. The lucky winner said he plans to retire now. “I’ve worked since I left school and I’m happy to be finishing up,” he said. In spite of having won a huge jackpot he plans to keep life simple: “I’m a laid-back person, so I’m just going to stay the same,” he said. The General Manager of Keno, Terry Fowler, congratulated Australia’s biggest Keno winner and said that their team is happy for the prize to be won by a player in New South Wales, the place where the game was initially introduced. Fowler said, “Keno loves to make millionaires and now we’re making multi-millionaires, so it couldn’t get any better for us than moments like this”. Mega Millions was released in New South Wales in November 2016 and has offered $64 million as prize money selling six million tickets. Mega Millions is the premium version of the existing Keno Classic game and offers players the opportunity to hit $5 million or more every three minutes just for $2. To win this jackpot the winner spent only $26 on the ticket, played 13 $2 games. The winning sequence of numbers was 6, 7, 9, 10, 25, 26, 41, 43, 75 and 77. Just to make you aware, New South Wales players win more than $36 million on an average every month playing Keno in different clubs and pubs around the state. 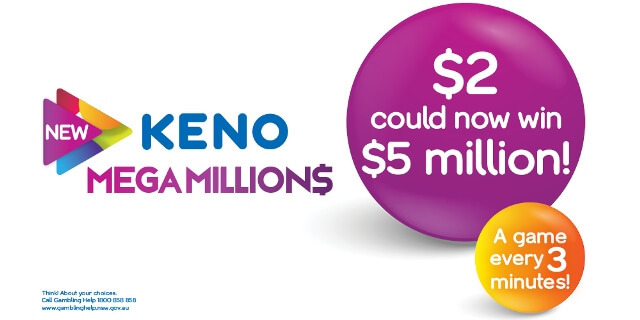 Every month, Keno pays out nearly $77 million in prize money to New South Wales, Queensland, Victorian, and ACT players. This entry was posted in News and tagged Biggest Jackpot won in Newcastle Club in Keno. Bookmark the permalink.